Big Stories in the Small City As a general assignment intern at The Roanoke Times, Rachel Hicks '19 learned how to be firm with difficult sources. 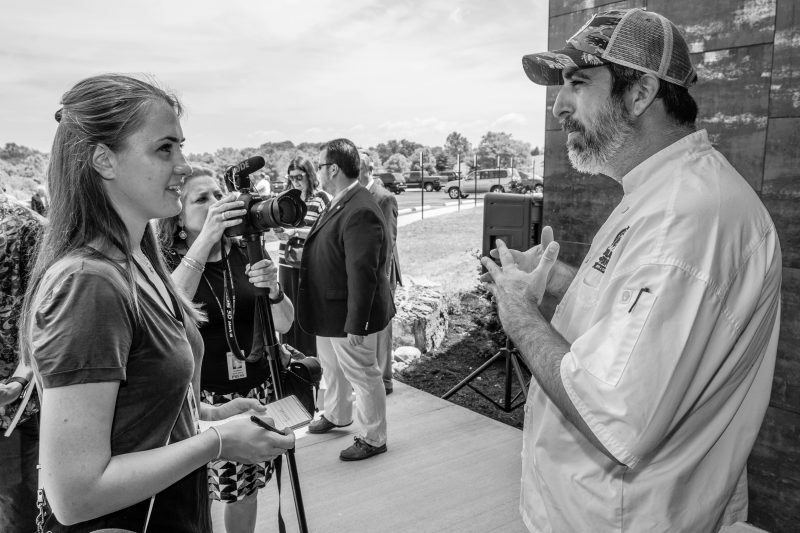 Rachel Hicks ’19 (far left) interviews the head chef of a new brewery as part of her summer internship at The Roanoke Times. Photo by Stephanie Klein-Davis | The Roanoke Times. The Roanoke Times is Southwest Virginia’s main newspaper. It’s published by Berkshire Hathaway and began publication in 1886. I was a general assignment reporter and got to write about many topics, from a retired nurse who survived five brain tumors to the Miss Virginia pageant. An Alex Jones Scholarship helped to fund my internship. There’s a girl with spinal muscular atrophy who lives in Botetourt County, whose parents are raising money to build an all-access playground in Daleville for children with or without disabilities. Kids with mobility issues will be able to play next to their friends. Also, the little girl with SMA wasn’t supposed to live past the age of two, but she’s eight now, and very content with her life. She’s in third grade at Greenfield Elementary and Skypes into class three times a week. Jeff Sturgeon, a reporter at the Roanoke Times, taught me to stop smiling and laughing every time I talk to people. He showed me how to be direct and pressing when I need information or am on deadline. Now, I understand that even if I’m not pleasing the person I’m trying to get information from, I will help the public by doing something with the information I receive. I had to stand my ground to get a public document from Lead Safe Roanoke. They wouldn’t give me the paperwork containing their application to the Department of Housing and Urban Development even though it was by law a public document. I had to read up on the law and educate them that they were obligated to give it to me in the next five days, whether it made their program look bad or not. To be honest, I almost cried, because I’m a people-pleaser and hate upsetting people, but I stuck to the truth and kept my shoulders back and got the information I needed in the end, and I earned respect both from the Lead Safe staff and the reporters at the Times. I got to meet a lot of locals in Roanoke, and they were all sweet, down-to-earth, and outdoorsy. We went hiking several times to the Cascades, and running on the Greenway, which runs alongside the Roanoke River. It was fun to assimilate to the small city, and I could actually see myself living here in the future for a short period of time. If you visit Roanoke, try the new Atlas Chocolate café. It’s quite lovely – they serve coffee drinks, gelato, and have a large assortment of chocolates. I loved working for news, so I know that I’d be happy working for a paper in the future. Maybe even a newspaper in a smaller city. I always dreamed of writing for a big-city newspaper, but I think I’d be happy working somewhere smaller, too. Quite honestly, all I want to do is write, so any form of writing, as long as it’s helping people in some way, is what I want to do. Professor Coddington really prepared me through Journalism 201. That class was stressful, but when it was over I felt like I could write anything under pressure, including the crucial details. People at the paper were surprised by how quickly I was able to draft articles and they were impressed by the content, so thank you, Professor Coddington!